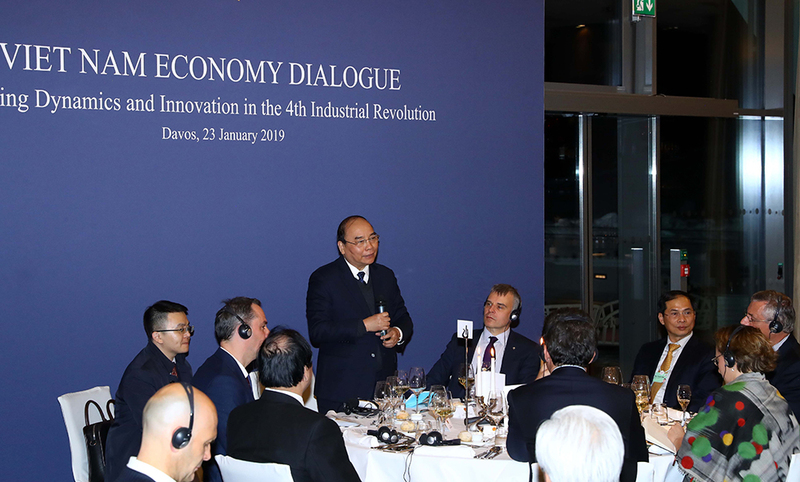 EuroCham Co-Chairman Nicolas Audier joined Prime Minister Nguyen Xuan Phuc and a select group of European businesses for a special event at the World Economic Forum in Davos, Switzerland. The event was organised jointly with the Ministry of Foreign Affairs and provided business leaders from some of Europe’s largest and most successful enterprises the chance to discuss business and investment opportunities in Vietnam in the context of the Fourth Industrial Revolution. Participants also discussed the EU-Vietnam Free Trade Agreement (EVFTA) and the need to ensure that this historic FTA can be ratified and implemented as soon as possible. 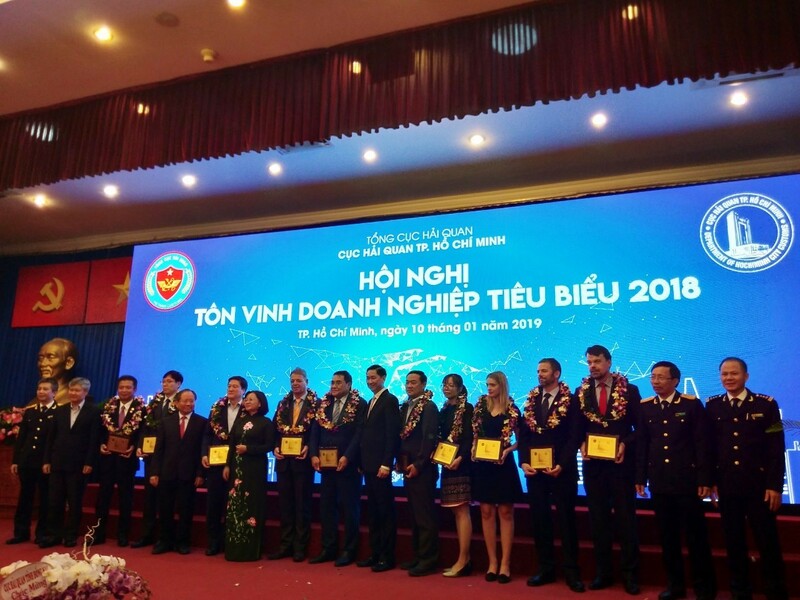 On the 10th of January 2019, a EuroCham Delegation led by Vice-Chairman Jean-Jacques Bouflet attended a conference held by the Ho Chi Minh City Customs Department to honour the businesses who have made a remarkable contribution to Customs in HCMC in 2018. 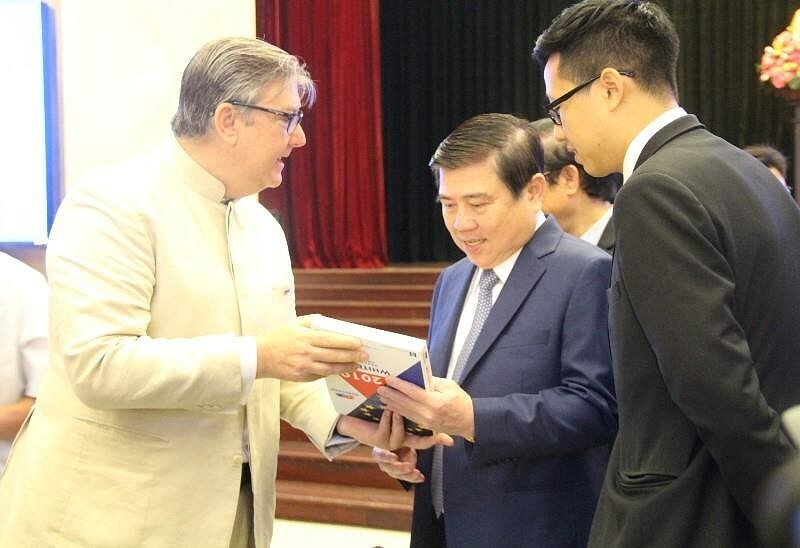 The event was attended by Mr. Do Hoang Anh Tuan, Deputy Minister of Finance; Mr. Ngo Van Can, General Director of the General Customs Department; and Mr. Tran Vinh Tuyen, Vice Chairman of HCMC People’s Committee. On this occasion, the Department of Customs recognised 200 businesses that have complied with customs regulations and contributed to the State budget with a Certificate of Merit. Among other Chambers and EU agencies, EuroCham was also awarded Medal for its cooperation with the Customs Department. During 2018, EuroCham was one of the most active Chambers, acting as a bridge between the Customs Department and the business community by continuously organising training sessions and dialogues to support European businesses in their daily operations related to Customs practices. Looking forward to 2019, Mr. Tran Vinh Tuyen committed that the city would continue to reform its administrative processes and to build an effective e-Government system in order to support the business community to further invest and operate. Mr. Dinh Ngoc Thang also committed that, in 2019, HCMC Customs will continue to promote administrative reforms, specifically to reduce export customs clearance time to 70 and 90 hours with imports. 3. 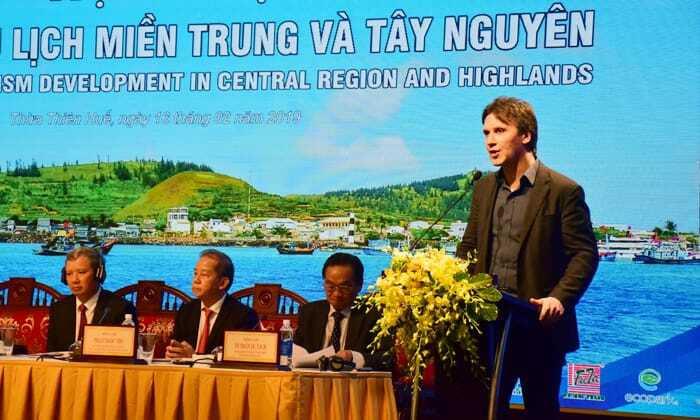 EuroCham attended the Conference "Tourism development in Central region and Highlands"
EuroCham Co-Chairman Denis Brunetti attended and spoke at the "Tourism development in Central region and Highlands" organised in Hue City. Prime Minister Nguyen Xuan Phuc chaired the conference, attended by over 700 delegates. Speaking at the conference seeking solutions for the development of regional tourism, the Prime Minister urged 19 provinces in this region to work harder for a common plan to boost the growth of tourism. The PM wanted authorities of the 19 provinces to work closely to finalise a plan for common development of the region’s tourism. During his speech, the Prime Minister also mentioned the cooperation and contribution from the European business community in the socio-economic development of Vietnam. He hopes that such cooperation would continue to be strengthened in the future, especially when enabling a smart economy by utilising Industry 4.0 revolution is the core plan of Vietnam. Co-Chairman Denis Brunetti emphasised in his speech the necessity to move towards industry 4.0 enabled by secure and trusted 5G to develop a smart economy. Industry 4.0 would enable the country to build "Smart City" and to implement "Smart Tourism". European businesses are committed to continuing the long-term investment towards the development of Vietnam, especially the Central region and Highlands. EuroCham launched the 11th edition of its annual Whitebook of trade and investment issues and recommendations. The event, with 287 participants, featured high-level speeches from Mr. Bui Thanh Son, Permanent Deputy Minister of Foreign Affairs; Mr. Pham Cong Tac, Vice-Minister, Ministry of Science and Technology; and Mr. Bruno Angelet, EU Ambassador to Vietnam and Head of the EU Delegation. The Whitebook is EuroCham’s flagship annual publication, bringing together the insights and recommendations of the Chamber’s over one thousand members. In the Whitebook, EuroCham members raise issues most important to their business operations, and highlight specific actions that the Government could take to improve Vietnam’s business environment and legal framework, increase trade and investment from Europe and make the country even more competitive in the global marketplace. The themes of the event were two issues most critical to ensuring the success of the next phase of Vietnam’s development: The EU-Vietnam Free Trade Agreement (EVFTA) and the Fourth Industrial Revolution. The conference included 2 parts: a high-level panel discussion with the participation of speakers from VCCI, EuroCham, Ministry of Industry and Trade (MOIT), Ministry of Planning and Investment (MPI), and the EU Delegation to Vietnam. This was followed by three thematic panel discussions featuring representatives from EuroCham’s Sector Committees and officials from the Government of Vietnam with the topics: “Healthcare in Vietnam”, “Tax & Customs Environment” and “Sustainability”. 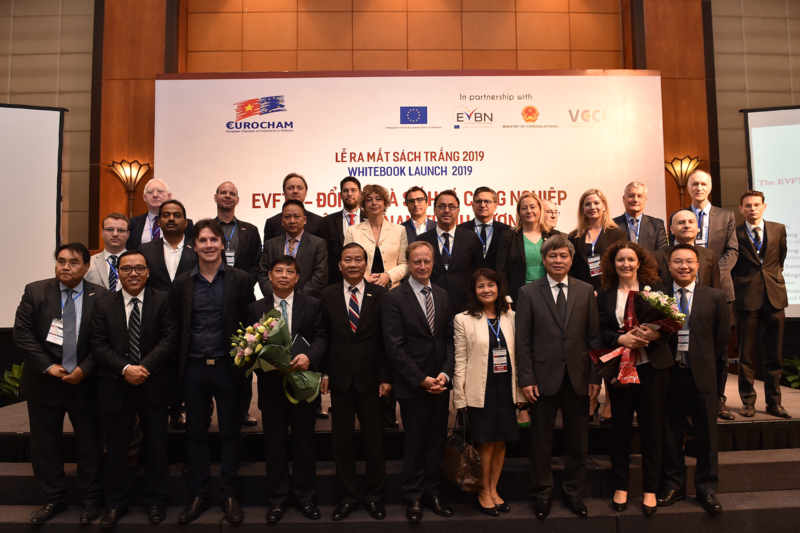 On the 20th of March 2019, EuroCham introduced the 11th edition of its annual Whitebook at a briefing event entitled: “The EU-Vietnam Free Trade Agreement: Ho Chi Minh City as the bridge to Europe”. The conference attracted 137 representatives from Ho Chi Minh City leaders, Departments and agencies; European diplomatic missions, Business Associations, EuroCham members and media agencies. The event featured speeches by Vice-Chairman of HCMC People's Committee Mr. Le Thanh Liem and Co-Chairman of EuroCham Mr. Nicolas Audier, along with presentations from 8 EuroCham Sector Committees addressing trade and investment issues and recommendations on three topics: Healthcare, Consumer’s Choice, and Sustainability and Efficiency. On behalf of HCMC leaders, Mr. Le Thanh Liem, expressed great appreciation to EuroCham for its efforts in promoting investment and trade in Vietnam, and especially in HCMC. He also affirmed the city’s willingness to facilitate European investment, particularly in light of the expected ratification of the EU-Vietnam Free Trade Agreement (EVFTA). Following detailed, sector-specific presentations from EuroCham Sector Committees, representatives from EuroCham, City departments (Customs, Planning & Investment), EuroCham’s close partners such as Vietnam Chamber of Commerce and Industry and EU-Vietnam Business Network (EVBN) participated in a stimulating panel discussion on EU FDIs, the City’s investment policies and outlook of the EVFTA for Vietnam and HCMC particularly to reap benefits and opportunities once the FTA is ratified. EuroCham Vice-Chairman Tomaso Andreatta attended and delivered a speech at the “Meeting between Ho Chi Minh City leaders and FDI enterprises 2019: Harness the resources, Shape the future”. Secretary of HCMC Party's Committee Nguyen Thien Nhan and Chairman of HCMC People's Committee Nguyen Thanh Phong attended and co-chaired the conference. Secretary Nguyen Thien Nhan emphasised outcomes of FDI investments in 2018. Addressing several issues that the City needs to deal with, the municipal Secretary asked the City’s departments and agencies to focus on making reforms and building a facilitative administrative system for the City. On this occasion, HCMC introduced 255 projects calling for foreign investment. EuroCham Vice-Chairman Tomaso Andreatta congratulated the City on being an attractive trade and investment destination for foreign investors. EuroCham fully supported the City’s efforts to enhance development planning works; speed up the progress of building a smart city; and develop its innovative, specialised zones in order to attract more knowledge-rich as well as high-tech FDI. Mr. Andreatta also highlighted EuroCham’s recommendations for the City on sectorial issues including infrastructure, mobility and clean energy solutions. Responding to EuroCham’s remarks, the attending HCMC Department of Planning and Investment, Department of Transport and Department of Social Insurance provided additional information on investment policies of Vietnam, regulations on social insurance for foreign employees and future infrastructure plans of HCMC. The Departments added that relevant authorities had well noted EuroCham’s recommendations and would proceed to ensure foreign investors enjoy favourable business conditions in the Vietnam. On behalf of HR&T, EuroCham Vice-Chairman in charge of Advocacy, Mr. Jean Jacques Bouflet attended the event. The workshop has been held successfully to gather opinions from business community in CSR practices. 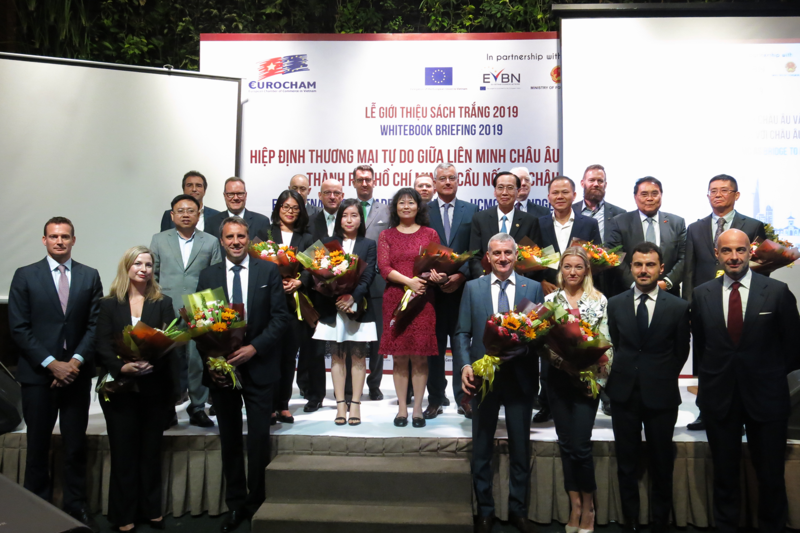 EuroCham, with the support of EVBN and the EuroCham Legal Sector Committee, organised a luncheon on the development of the Vietnamese PPP legal framework with the participation of 50 members. During the event, Ms. Vu Quynh Le – Deputy Director of Public Procurement Agency, Ministry of Planning and Investment (MPI) – gave a presentation about the positive key changes of the draft Law on PPP and the feasibility of its implementation while Mr. Jose Angelo Estrella Faria - Head of Office of Legal Affairs, United Nations, shared information about the UNCITRAL Legislative Guide on PPP & Recommendations. Many recommendations of EuroCham's Legal Sector Committee members on Vietnam's PPP regulations, and some key lessons learned from foreign PPPs, were presented. The panel discussion was held to answer inquiries from the participants about all related matters of PPP legal framework. EuroCham and its Legal Sector Committee will further follow up with MPI and key stakeholders to address our issues and recommendations onto the draft law on PPP. A delegation led by EuroCham Vice-Chairman Jean-Jacques Bouflet and TLSC Chairman Juergen Weber had a meeting with the Ho Chi Minh City Department of Customs (HCMC DOC). During the meeting, HCMC DOC and EuroCham TLSC committed to continue their collaborative relationship in 2019, hold a training session in May, and hold the annual Dialogue with the European business community in September. Key customs issues that TLSC mentioned in the WhiteBook 2019 were also discussed. HCMC DOC understood the concerns expressed by EuroCham members, and committed to raise a number of proposals to the General Department of Customs to reduce the customs clearance time and lighten the administrative burden. HCMC DOC also asked for the support of the business community in ensuring the transparency of Customs procedures by: not supporting any forms of informal payment, reporting all improper behaviors of Customs officials via the Customs hotlines and only using official Customs broker agencies. TLSC organized a meeting for TLSC members with Saigon New Port (SNP) at Cat Lai Port. TLSC members had the chance to address their concerns regarding the operation activities of SNP. SNP representatives shared that in order to address congestion, they are pushing to have their system integrated with Customs authority, so that the clearance times could be reduced; at the same time, they are proposing to utilize the ICDs to release the pressures on Cat Lai Port.